Welcome back to our weekly Vanguard update! We finally had the rest of G-BT04 Soul Strike Against the Supreme revealed in the last couple of days and they include some great cards for multiple clans. Genesis get another grade 3 in this set, making it three grade 3s in total. God of Dreams, Oneiroi‘s first skill is similar to Battle Maiden, Mizuha in that he gets +5000 power and +1 critical, though instead of a soul blast of 3, Oneroi’s is a soul blast of 6. The benefit in using Oneiroi is that, unlike Mizuha, Oneiroi has an 11k base power making him both offensively and defensively better and his skill is a Generation Break 1 instead of a Limit break so you won’t have to worry about how much damage you have. His second skill is an ACT that lets you soul charge 3 for a counter blast of 1. You can use this skill to set the soul up for Fenrir. A lot of people may choose Goddess of Hearths, Hestia over Oneiroi, though both have pretty good on-hit pressure. Genesis also get three new trigger units: A critical trigger (Bumping Buffalo), a heal trigger (Goddess of Youth, Hebe), and a draw trigger (Witch of Cherries, Poppy). All these triggers have no additional effects though the draw is the first draw trigger for Genesis Witches, giving them a nice bit of defence to accompany their strong offensive capabilities. Wisteria Knight is a new Neo Nectar grade 2. If you have another one of him on the field he gains +2000 power and the ability to counter blast 1 and draw a card if his attack hits a vanguard. 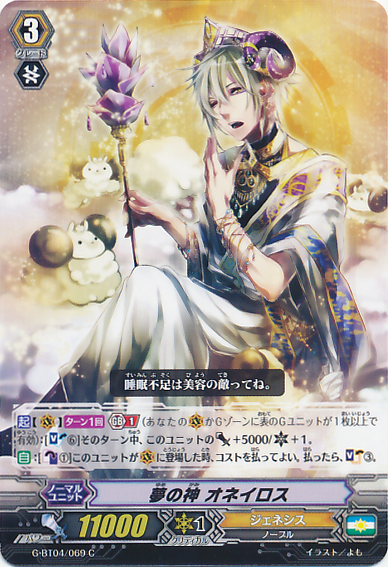 This card works well with Dream-spinning Ranunculus, Ahsha who gives him +5000 power and Early Flowering Maiden, Pia who could easily add up to +9000 power. Your opponent will be losing a lot of cards trying to stop you from drawing the one or two extra cards. Angel Feather gain a couple of interesting cards. 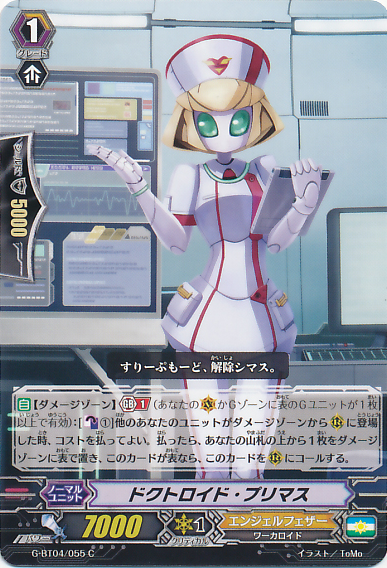 Doctroid Primas is a grade 1 who works from the damage zone. When another of your units is placed on a rear guard circle from the damage zone, you can counter blast 1 and put the top card of your deck into the damage zone to call Primas to a rear guard circle. Not only does this give Angel Feather a consistent field, it also allows power boosts to units like Nurse of Broken Heart; Black Shiver, Gabriel; Thousand Ray Pegasus; and Million Ray Pegasus. Doctroid Lifros can also give power boosts to the above mentioned units as well as essentially counter charging 2. Lifros is a stand trigger that can counter blast 1 and is the put back into the deck, by doing so you can put up two cards (whether face up or down) from your damage zone into your deck, then after shuffling your deck take the top two cards from your deck and put them into the damage zone face up. This makes your damage zone more consistent by providing more chances of getting Cleanup Celestial, Ramiel “Яeverse”; Solidify Celestial, Zerachiel; or Spiral Celestial, Hellm into your damage zone. 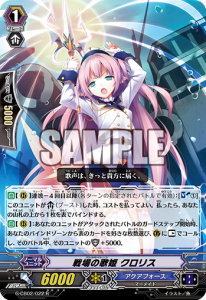 Angel Feather also get two new vanilla triggers, MRI Angel (draw trigger) and Nurse of Danger Heart (critical trigger) as well as an 8k vanilla grade 1, Black Pain, Marut. As well as Genesis Witches, Shadow Paladin Witches also get more support. 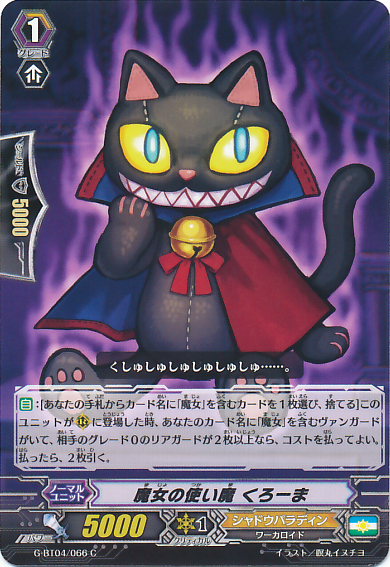 Witch’s Familiar, Kuroma is a grade 1 that has a Nemain-like skill. When this unit is placed on a rear guard circle, if your opponent has two or more grade 0 rear guards, you can drop a Witch from hand and draw two cards. While Nemain can still be faster, this unit, unlike Gyva, does have the potential to be just as fast, maybe even faster. With the help of units like Dana and Deirdre you can easily pull this off early game with no counter blasts, and even though Kuroma is only a grade 1 he’s still 2k more powerful than poor ol’ Nemain. 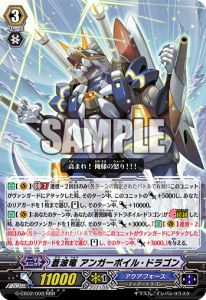 Long Horn Hunter is the common grade 3 for Megacolony. 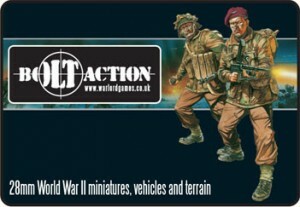 When he’s placed on a vanguard or rear guard circle you may counter blast 1 to rest and paralyse an opponent’s rear guard, as well as preventing them from intercepting. This may seem like a fairly big cost seeing as it’s not a giga-paralyse (Letting you draw if their unit is still at rest at the end of your opponent’s turn) but Long Horn Hunter can still be used well as a back up grade 3 for Intimidating Mutant, Darkface. 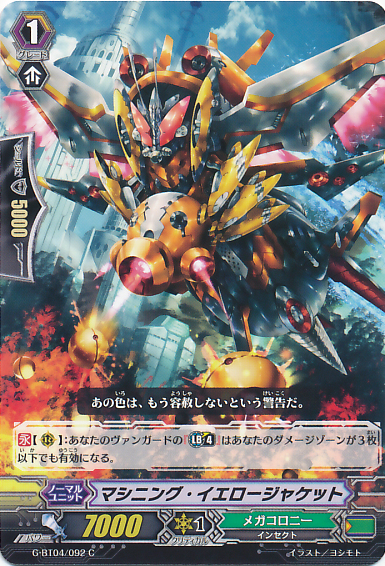 A lot of people may want to choose Cyclomatooth instead of Long Horn Hunter as a back up grade 3, if you do then Machining Yellow Jacket will help, being the limit break enabler for Megacolony. Machining players will also be happy to use Yellow Jacket along with Machining Spark Hercules and Machining Warsickle. Spark Hercules requires a counter blast of 2 cards with “Machining” in their name, so having a good grade 1 Machining to fill up the deck build will help him in more than one way. 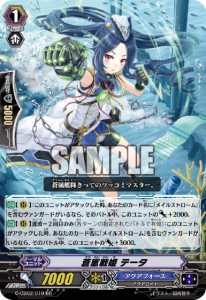 Abyss Diver is an 8k grade 2 who, when placed on a rear-guard circle, allows you to counter blast 1 and soul blast 1 to paralyse an opponent’s unit and prevent them from intercepting. This is similar to Machining Papilio though with a bigger cost, the pay off being that your opponent is stopped from intercepting. Papilio may still be used more due to the fact that she doesn’t drain the soul and Darkface needs a soul blast of 2 to rest called units. 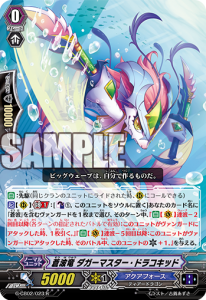 Abyss Diver can still be used for other Megacolony decks like Avectro Zeus, or maybe even if they finally decide to give Giraffa the revival Legion that some people desire. We also get a vanilla critical trigger (Bad Trip), a vanilla heal trigger (Cocoon Healer), as well as a grade 1 vanilla (Megacolony Battler D). 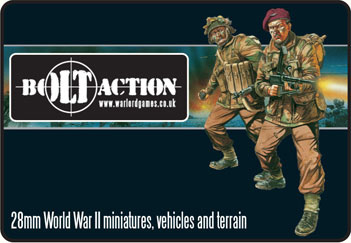 Lastly we have the new Royal Paladins that many people have been waiting for. 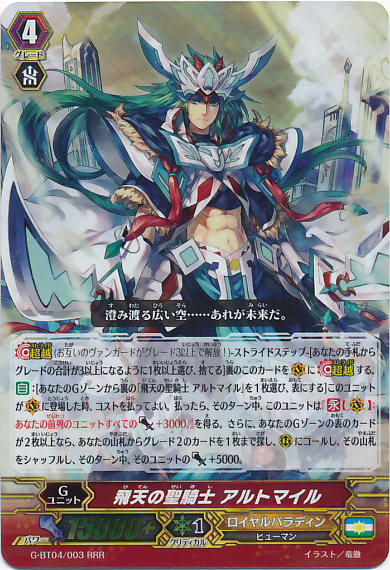 Soaring Divine Knight, Altmile is the new stride version of Altmile and the good news is that he is flexible in not needing a specific heart unlike Chronodragon Nextage. 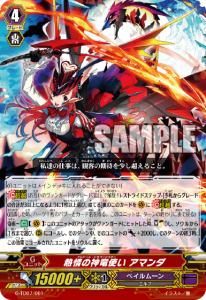 By G persona blasting the front row gains +3000 power and if the number of face up cards in your G zone is two or more, you can also superior call one grade 2 from your deck, and that unit gains +5000 power. 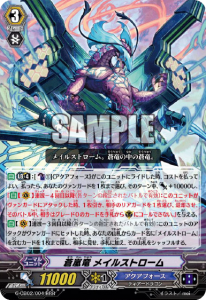 With this and Blue Sky Knight, Altmile you can give the front row +8000 for a G persona blast and a counter blast of 1, or you could mix it up a little and give one column +10k due to Altmile’s flexible effects. This will also allow you to easily call Swordmy to help Sanctuary Guard Dragon and general grade 1 consistency. The last card revealed this week was Knight of Dexterity, Jed. With the help of the new Altmile this card can apply some good pressure on your opponent. When his attack hits you can give another rear guard +5000 power so using this unit for the first or second battle will force your opponent to guard or face an even stronger attack. 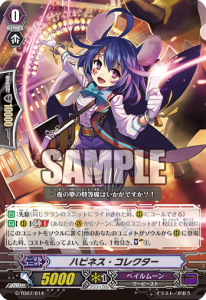 Now that all the G-BT04 card have been revealed the next set for Japanese release will be the G Comic Booster 01: Vanguard & Deletor, providing support for Royal Paladin and Link Joker. Next week we will be expecting some spoilers for the Comic Booster so check back next week for more updates!